EO61WBK MERCEDES-BENZ C CLASS 2.1 C250 CDI BLUEEFFICIENCY SPORT ED125 4d AUTO 204BHP The C250 Sport Looks stunning in Blue and offers a great specification of 18" alloy wheels, Sat Nav, front and rear park sensors,Half leather vinyl interior, isofix, dual zone climate control, FM/CD/AUX/USB, Autolights with Xenon headlights Multifunction steering wheel, cruise control, speed limiter, bluetooth, electric windows and remote central locking . The 2.1 Diesel offers great MPG return and fantastic reliability from Mercedes chain driven engine. 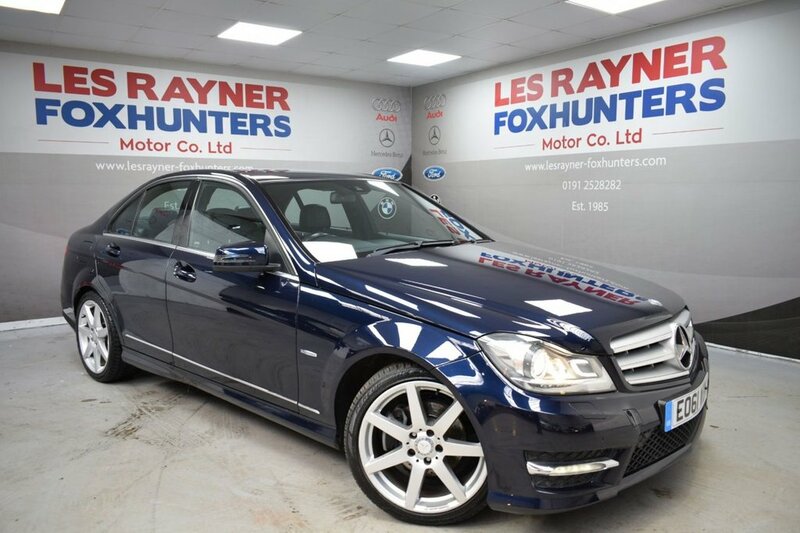 6 months	£77.00 12 months	£140.00 MPG Extra	67.3 MPG Combined	56.5 MPG Urban	44.8 TO VIEW ALL OUR STOCK VISIT www.lesrayner-foxhunters.co.uk We are a family run business that has been established since 1982.All of our cars are HPI clear and come with a 12 month MOT, Full Service and Pre Delivery Inspection so you can buy with confidence. Personalised Videos and Facetime available! LOW RATE FINANCE! BESPOKE HIRE PURCHASE, PCP & LEASE PURCHASE PACKAGES! PART EX WELCOME! NO SALES ADMIN FEE!